You’ve asked and Netflix has answered! I am so thrilled to announce that my bestselling Virgin River book series is being made into a series on Netflix. Thank you so much my wonderful readers. Your love of Virgin River helped make this happen. You’ll meet some of your favorite Virgin River characters in the beautiful small town set deep in the woods of northern California. I hope you’re as excited as I am and are looking forward to returning to Virgin River. Here’s the Netflix press release. 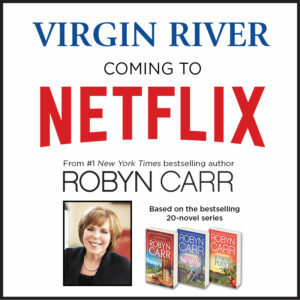 Netflix has ordered 10 episodes of Virgin River, a contemporary romance based on the beloved Harlequin book series that took author Robyn Carr to the top of the New York Times bestseller list. There are now twenty books in the Virgin River series, and together they have sold more than 13 million copies. Virgin River was named to The HarperCollins 200 list, which celebrates 200 iconic books of the past 200 years. Melinda Monroe answers an ad to work as a nurse practitioner in the remote California town of Virgin River thinking it will be the perfect place to start fresh and leave her painful memories behind. But she soon discovers that small-town living isn’t quite as simple as she expected and that she must learn to heal herself before she can truly make Virgin River her home. Reel World Management and Roma Roth are producing the series for Netflix. Sue Tenney will serve as showrunner and executive producer. Roma Roth and Chris Perry will executive produce. The show will start production later this year. Now you know as much as I know about this exciting adventure. I’ll be making future announcements and as I receive more information, I promise not to hold out!